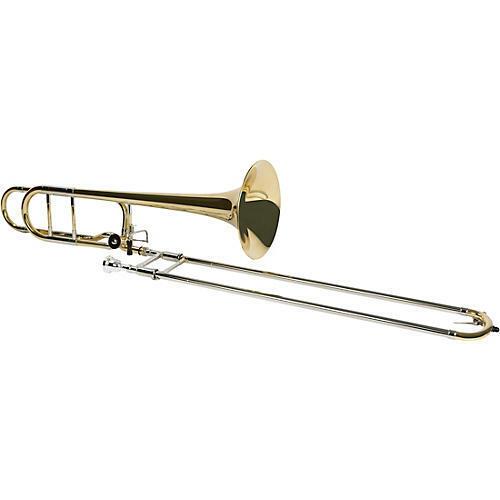 The Allora ATBB-450 Vienna Series Bass Trombone is an affordable trombone for school programs or the advancing musician. The .562-inch bore offers a larger overall sound projected through the 9.5" yellow brass bell. Featuring a standard leadpipe, inline traditional rotor, open wrap F-attachment design along with the well weighted hand slide, the ATBB-450 is perfect for any school program or advancing musician. Comes complete with a premium nylon polyfoam case, a large shank mouthpiece and a three-year warranty. A used or extraordinarily cheap instrument can actually lessen your child’s likelihood of continuing in music. With the Allora Vienna series, you get a quality instrument that will play in tune, withstand student treatment, and inspire pride of ownership. Allora instruments are carefully manufactured according to specifications and development accumulated over many years by our team of brass and woodwind buyers. The result is a line of instruments that play well, are durable, and possess a satisfying tone and dynamics capability, all with a price that makes it much easier to get involved with music. Continue your journey in music with the Allora Vienna series. Order today.